If you're scouting for a casual yet stylish look, consider wearing a light blue dress shirt and navy ripped skinny jeans. Both garments are totally comfy and will look fabulous paired together. Sporting a pair of tan leopard suede loafers is a simple way to add extra flair to your outfit. If you're all about relaxed dressing when it comes to fashion, you'll love this cute pairing of a beige open cardigan and navy ripped skinny jeans. Add a glam twist to your outfit with grey suede over the knee boots. 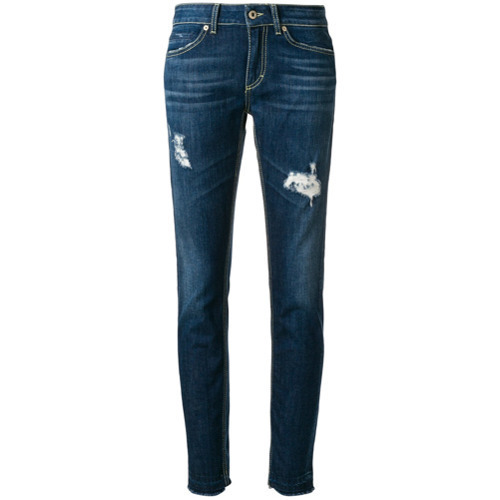 This combo of a blue denim shirt and navy ripped skinny jeans is simple, totally chic and super easy to copy! To add oomph to your outfit, complement with beige leather pumps. 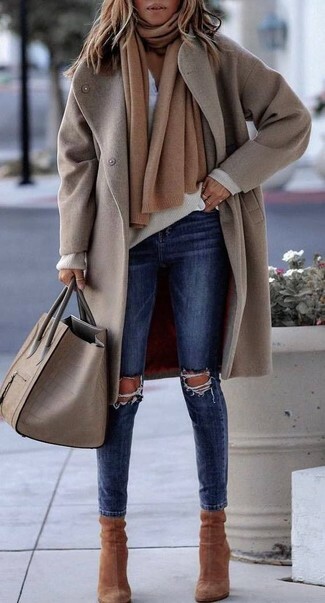 If you're on a mission for a casual yet totally chic ensemble, team a beige coat with Dondup ripped skinny jeans. Both garments are totally comfy and will look fabulous together. Opt for a pair of brown suede ankle boots to instantly up the chic factor of any outfit. If you're scouting for a casual yet absolutely chic outfit, choose a white peplum top and navy ripped skinny jeans. Both items are totally comfy and will look fabulous paired together. Got bored with this getup? Enter navy suede pumps to switch things up. If you're a fan of relaxed dressing when it comes to your personal style, you'll love this cute pairing of a white knit open cardigan and Dondup ripped skinny jeans. Spruce up this look with grey suede ankle boots. Who said you can't make a style statement with a casual getup? You can do so with ease in a grey coat and Dondup ripped skinny jeans. Elevate your look with silver leather oxford shoes. If you're searching for a casual yet stylish getup, marry a white and black leopard button down blouse with Dondup ripped skinny jeans from farfetch.com. Both pieces are totally comfy and will look fabulous together. You could perhaps get a little creative in the footwear department and lift up your look with brown leather tassel loafers. If you're obsessed with relaxed dressing when it comes to fashion, you'll love this extra adorable combination of a white and black horizontal striped oversized sweater and Dondup ripped skinny jeans. Got bored with this outfit? Enter black leather ankle boots to change things up a bit.